Over the next few weeks, we’re going to see projections, rankings, and tiers produced from every fantasy football outlet. PFF’s rankings are a collaborative effort, headlined by three of last season’s top-20 in-season rankers. Sortable by overall rank, positional rank, and by each individual ranker, they are a fantastic guide to help you prepare for upcoming 2018 fantasy drafts. One of the most fruitful exercises I’ve done the past couple years is see where the staff agrees and disagrees on particular players. There were very minor differences in our top-24s, so I started my search looking at players ranked No. 25 through 150 to see where the PFF Fantasy staff most agrees on players. My biggest takeaway after going through this exercise is that these are players drafters should feel comfortable with drafting at their current ADP. Given the close standard deviation among our seven PPR rankers, these are players that our entire staff projects closely in their rankings. Let’s take a look at some of the more noteworthy agreements. Despite the change at quarterback, the PFF Fantasy staff isn’t that worried about any learning curve for Case Keenum throwing to his new targets in Thomas and Sanders. Thomas had a standard deviation of just 2.8 between our rankers, with all of us ranking him at the Round 3-4 turn. Thomas is the only player to have 140-plus targets in each of the past six seasons, showcasing both productivity and health longevity. Sanders (5.7 std dev) missed part of last year due to injury, but prior to that, had 1,000-plus receiving yards in three straight seasons. His Round 7-8 ADP makes him a current value if he’s able to bounce back without any health concerns. We saw Keenum support two top-15 fantasy wideouts last year in Adam Thielen (WR11) and Stefon Diggs (WR13) in PPR points per game. Given the lack of tertiary targets, Thomas and Sanders should once again capitalize on large target shares heading into 2018. Given the volatile nature of Cooks’ boom-or-bust style of play, his standard deviation among our rankers of just 3.4 was one of the more surprising finds. The Fantasy Playbook shows us that Cooks had 14 top-12 fantasy wide receiver weeks over the past three years. He also had 12 weeks where he finished WR60 or lower during that span. 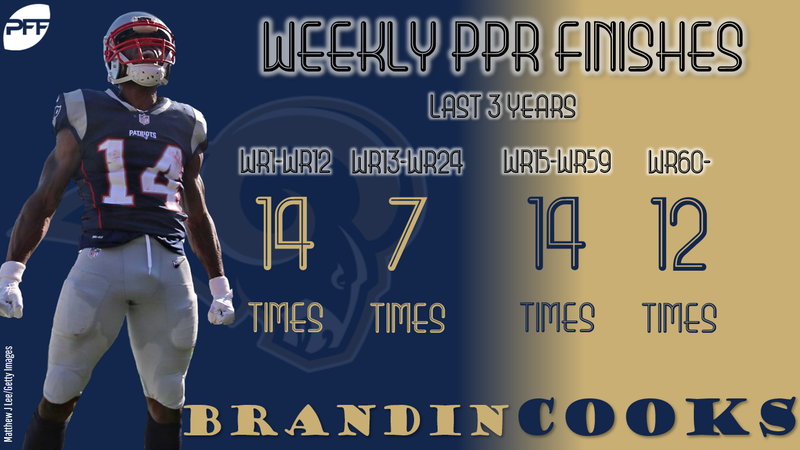 Cooks moves onto his third team over the past three years, a rarity for such a young, productive wide receiver. The Rams passing pie looks loaded with potential pass catchers entering the season, yet Cooks may possess the highest ceiling of them all as a key cog in the passing attack. Our consensus rankings have him as the WR25, right in line with our projections — WR24. Crowell (5.4 std dev) joined the Jets via free agency this offseason, taking over the role vacated by Matt Forte. Crowell was a fantasy draft darling of many this time last year, but never really capitalized on his potential playing for Cleveland. The Jets are hoping to provide some more winning gamescript for Crowell, and our fantasy rankers tend to think he could capitalize on that potential, coming in as our overall RB35. Crowell ranks from RB33 to RB38 in our consensus rankings, marking him as a low-end RB3/flex play at best. The Jets offensive line warrants pause for concern, but the volume should be there for Crowell to warrant flex consideration now that Elijah McGuire is expected to be sidelined heading into the regular season (broken foot). Before Jimmy Garoppolo took over as starter, Marquise Goodwin saw a catchable ball on only 53% of targets (84th of 89 WR) and had a 17.2-yard aDOT (PPR WR45). With Garoppolo, Goodwin had a 14.3-yard aDOT, was PPR WR8, and his catchable target rate jumped to 76% (24th of 89 WR). Every clip coming out of 49ers camp has Goodwin burning defensive backs in one-on-one drills. It wouldn’t be shocking in the slightest to see Goodwin’s ADP continue to creep up as we get closer to Week 1. Recent injury concern may cause some shakeup for Cobb’s current consensus ranking (5.9 std dev), but the No. 2 passing option for the Packers has many of our drafters eager to select him in fantasy drafts. Cobb’s dealing with some soreness in the same right ankle he recently had surgery on (mid-June) to remove some cartilage. He’s been given a few nights off to recover and hopefully this doesn’t become a lingering issue come Week 1. Cobb has a chance to return massive fantasy dividends at his current Round 7 ADP. He ran 77.7 percent of his routes from the slot last year, catching 73.3 percent of his targets. Entering his age-28 season, he’s just a few years removed from leading all wideouts in WR rating (134.3 in 2014). If health is on both Cobb’s and Aaron Rodgers’ side, Rodgers has shown he’s no stranger to producing multiple top-24 fantasy wide receivers in the same season (six times to date).